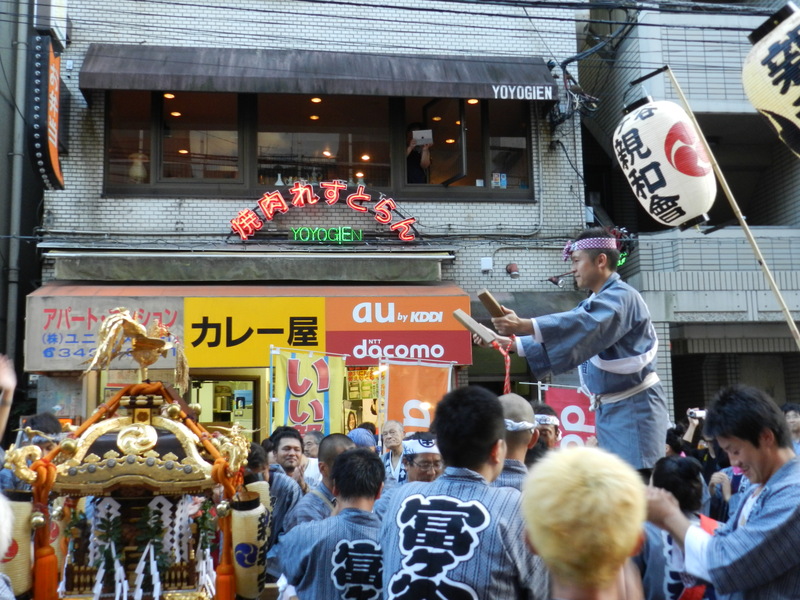 The fact that I`ve been blogging for two full years and haven`t done a post on a matsuri is shameful an oversight. Especially given the number of these that occur throughout the year. 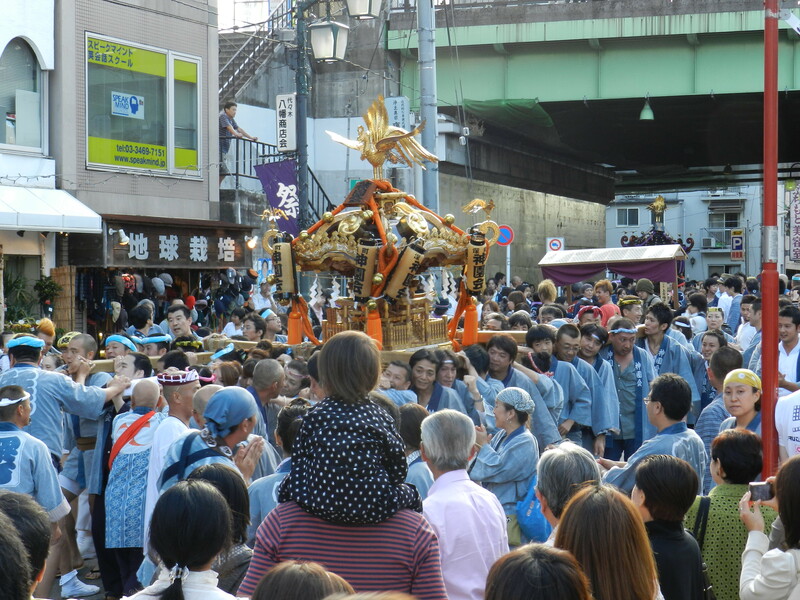 During a matsuri, the neighborhood shrine`s delegates take the local kami- deity or god- for a walk through the neighborhood. Since it only happens once a year, best to make sure it`s worth while for the house bound kami. A parade is in order. (Kami, I feel ya. 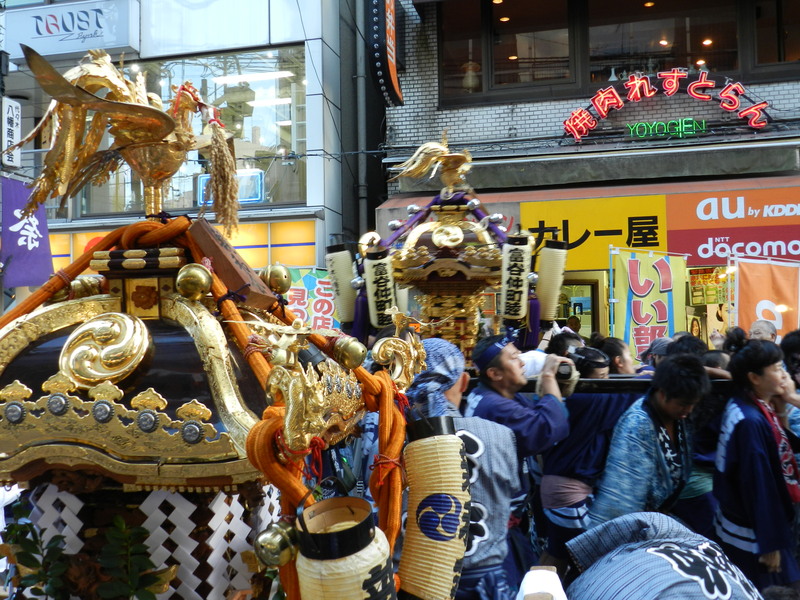 Sometimes I leave the apartment banging pot lids together after a long stretch of apartment enshrinement) Kami leave the shrine encased in a mikoshi (float) accompanied by much fanfare. And drinking, chanting, banging of drums, goldfish fishing, gaming, and eating. And maybe a quick game of pachinko. Everybody celebrates. 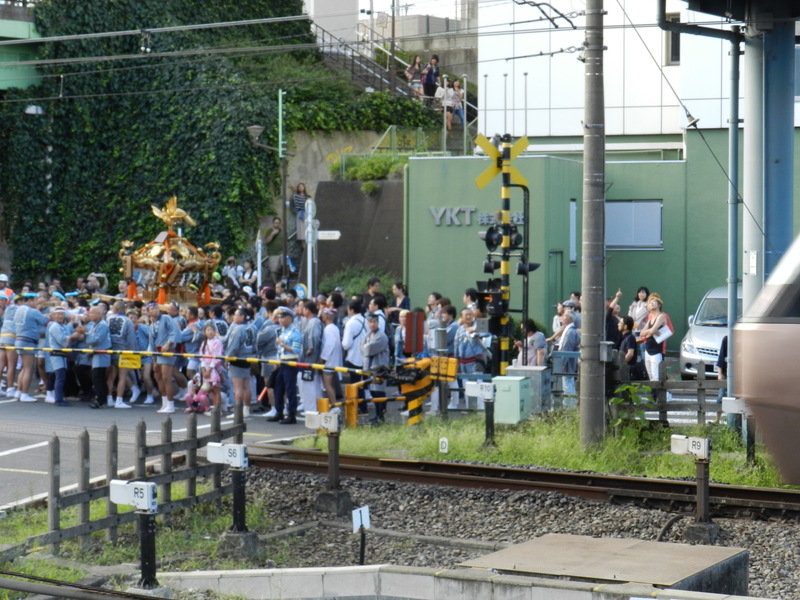 Normally stoic Japanese are all smiles as the mikoshi makes its way down the street. 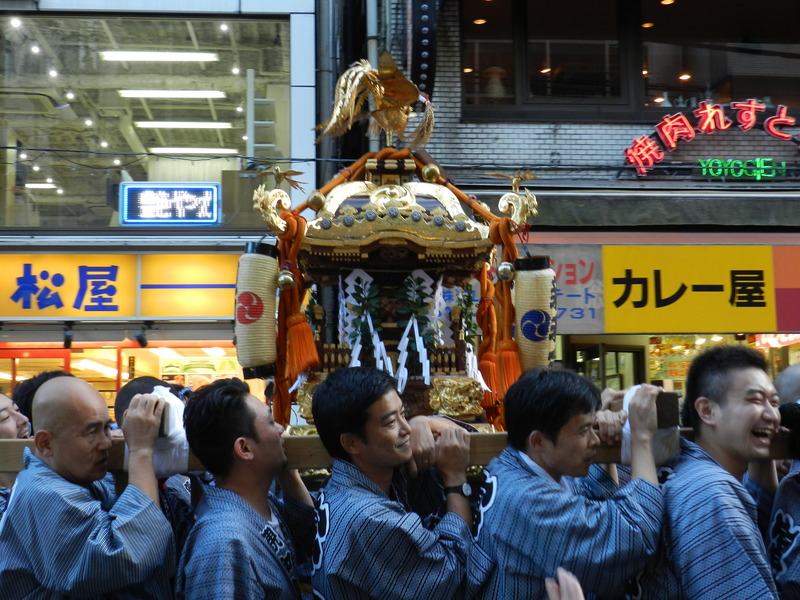 Men and women carry the mikoshi. 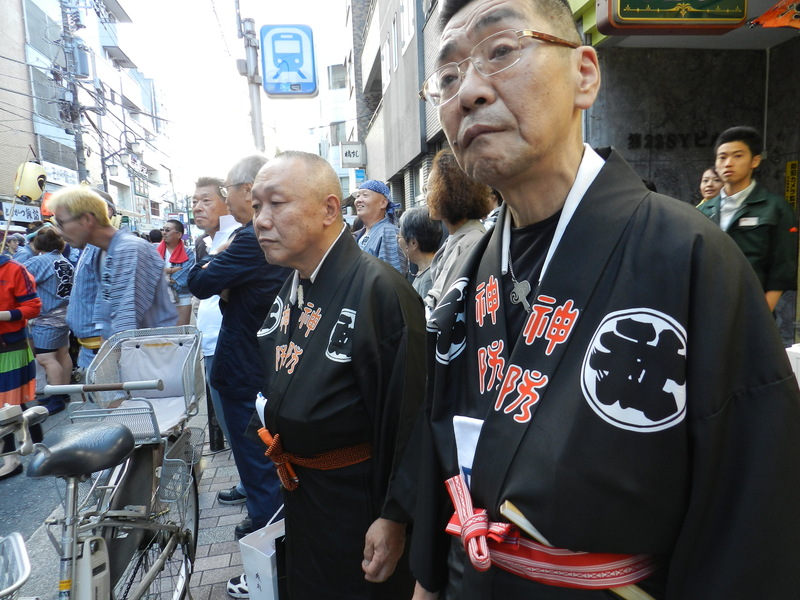 Many of the onlookers wear a short sort of yukata (in navy blue) which indicates the neighborhood of the matsuri. 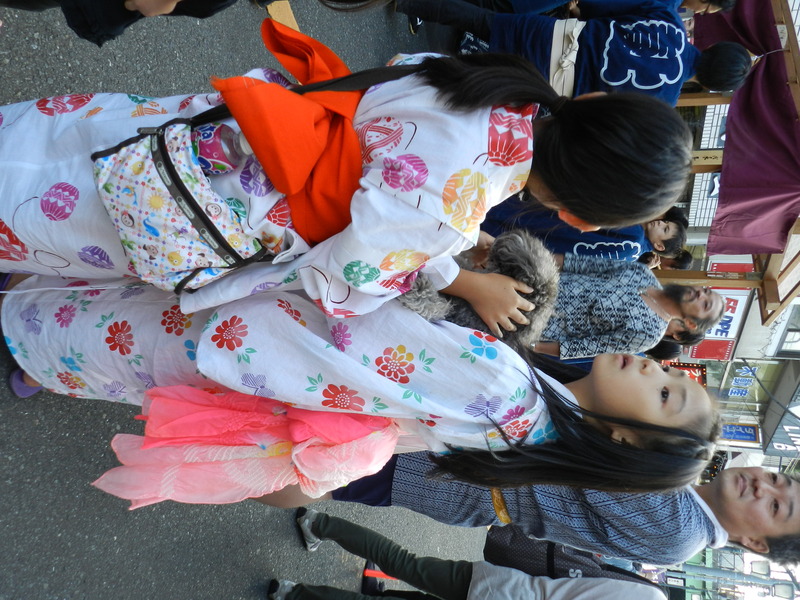 These girls are wearing traditional yukata- a light weight kimono worn during the summer. Already these young girls are displaying the amazing ability innate to all Japanese women- the power to accessorize, in this case with a purse and live fur ornamentation. I really love matsuri festivals. These shoes are “jika tabi.” Rivaling the croc as the ugliest shoe to hit the big time, it`s a favorite for anyone not wanting to slip. Used by fishermen, rickshaw pullers (drivers? ) 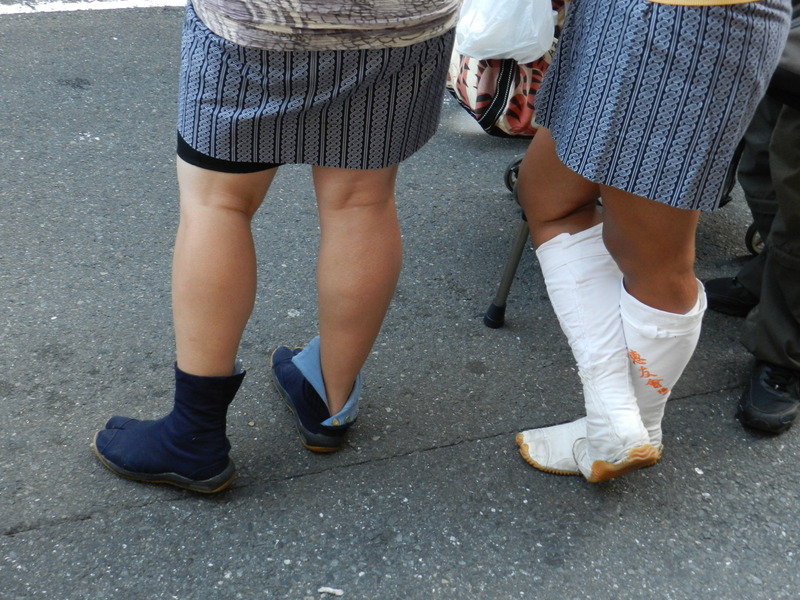 and matsuri participants, this shoe is the ultimate spidey shoe. Afraid of these two who were much more serious than the rest of the revelers, I opted for the fanny pac sneak shot. 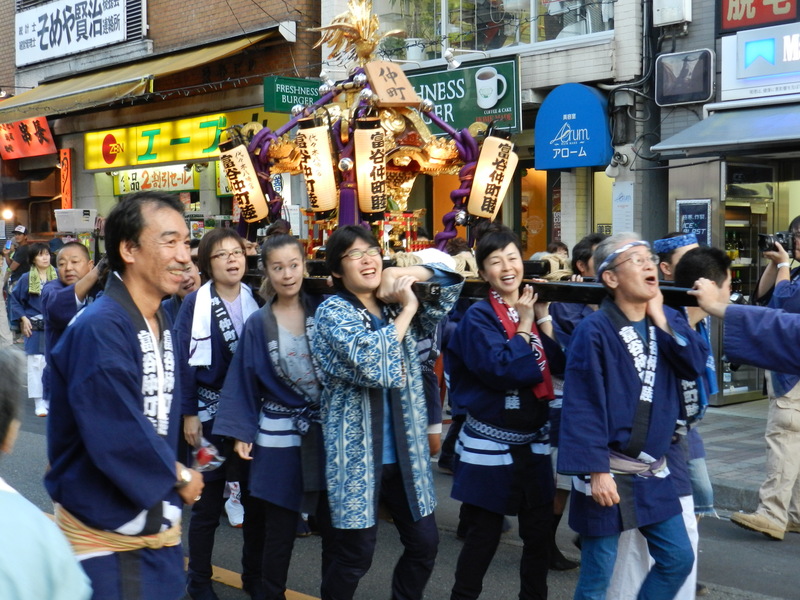 Matsuri`s happen during the spring and fall. Truly a place to see a lot of happy people in one place. For great pics of matsuris, take a peak at Tokyobling`s blog here. 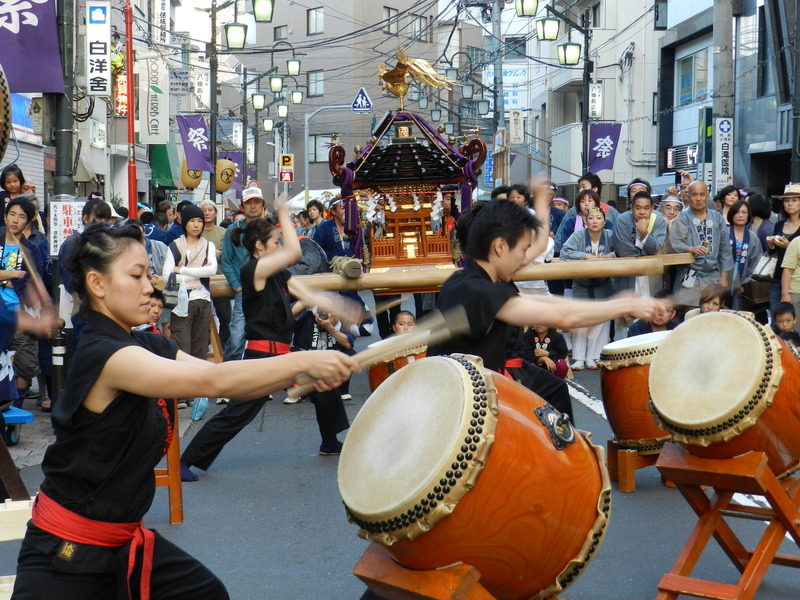 This entry was posted in Moving to Japan and tagged Amblerangel, Culture, Emily Cannell, ExPat, Family, Hey From Japan- Notes on Moving, Humor, Japan, Matsuri, Moving, Taiko Drums, Tokyo, Travel, Vacation. Bookmark the permalink. I don’t think jika tabi rival crocs, I think they beat them in that department! And yes, it is a bit shameful not to have covered a matsuri before. But hey, at least you have Tokyobling to fall back on! hahahah! I remember the first time I saw them was in Hawaii- I just couldn`t believe how ugly they were. The woman wearing them had no idea where they came from- all she knew was that they were slip proof and she swore by them. We were on a canoe trip. If she only knew!!! You are so right. Tokyobling is the Man for pics of Japan right? I’ve been to Hawaii before, too. Mum bought a pair of crocs there. They weren’t that ugly, they looked almost normal, in fact, just like rubber thongs (flip-flops, if you’re American. It actually never occurred to me to ask). great photos! especially the “behind” shots! When we moved to Japan, I expected the Japanese to be very modest. Maybe because of the kimono. Nothing could further from the truth. Although shy and quiet in demeanor, the Japanese are not the least bit inhibited. In fact, I`m coming to realize that we Americans are the ones with the inhibitions. Perhaps our Puritan roots? The first time I found I was standing next to a couple of these guys waiting in line for a yakitori I almost feinted with embarrassment. Ha! Feinted with embarrassment. Like it! I remember the Matsuri in my little town. There was great fanfare. It was the New Year’s party so none of the men were so scantily dressed as your party peeps. Love the pictures. It truly is a big party for this one. Lots of fun. I love looking at the people laughing and having such a good time. the ‘I really love matsuri festivals’ part mad me laugh out loud. Lord you should have seen me when I found myself next to three virtually naked men….. I cannot believe you guys are there for 2 yrs. already. I guess times flies faster in the states than it does for you. I absolutely LOVE your blog and always look forward to reading of your adventures, trips, the pictures, everything. I feel like I am taking a course in “Knowing Japan”. Thanks for the blog. Say hi to Tom for me and I am glad you are all doing well. Hey there! Glad to hear from you! Thanks for the nice words Cathy! What was the kami in this matsuri? The statue they’re carrying looks a little like a falcon. 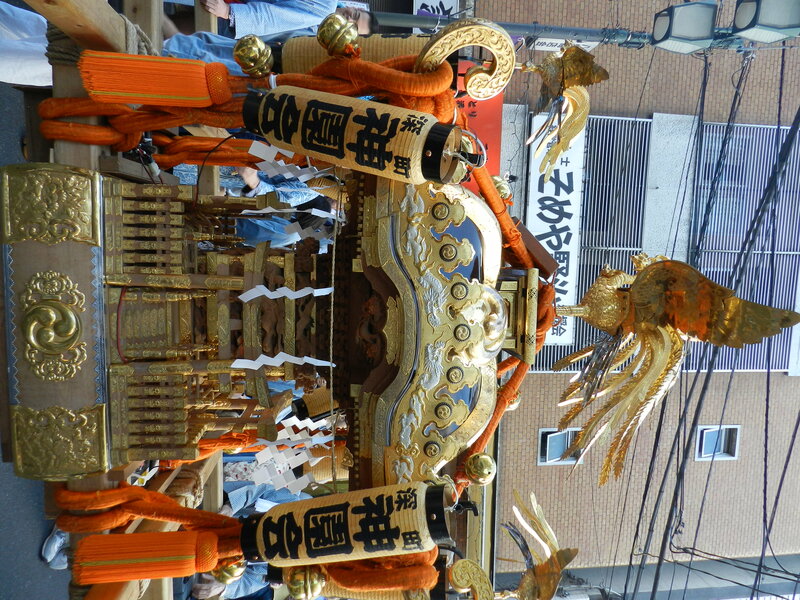 Hey Jackie- that is a Phoenix and is usually on the mikoshi. It represents the sun dying in flames at sunset and of course rising at the next. With it comes the association with life, death, rebirth and resurrection. 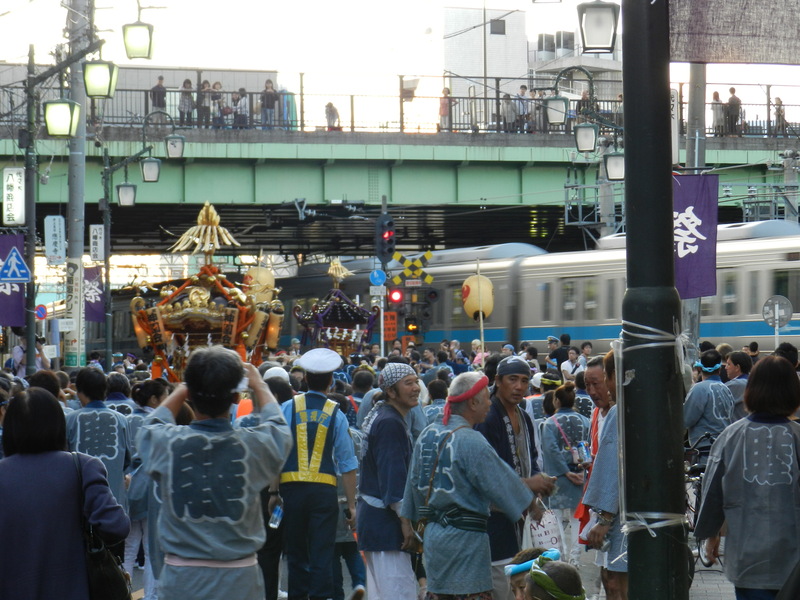 I`m not sure about the kami- I don`t know where this matsuri originated. I don`t think they really are identified as individuals- just that there is one in a mountain say- or a tree or rock. Usually they are present in natural structures or nature- not living things. Wind, sand etc.